I’ll admit to not being a massive fan of Gothic Rock but it seems that Season Of Mist may have taken steps towards changing that with their reissue of Christian Death’s second album, originally from 1984. Gothic Rock, that strange amalgamation of Post-Punk and romantic styles, has a strange influence over much Metal, without clearly being responsible for much or even being a generally recognised part of the underground Metal world. Yet those of you who have listened to Marilyn Manson at some point or other will recognise the Gothic influence there, whilst the melancholic likes of My Dying Bride were clearly influenced, and Cradle Of Filth have been long supporters of Christian Death, to the point of taking them on tour. Why listen to such a dated genre, however? Well, the most obvious element to focus on are the vocals, provided by Rozz Williams, and the most obvious comparison is David Bowie, although there are shades of Lou Reed and Jim Morrison of The Doors present too. From virtually the first track you’re faced with a twisted melancholy over a refined Post-Punk backing sound that is deceptively simple, slipping and sliding over you seductively, dreamily, without ever seeming to actually be present. 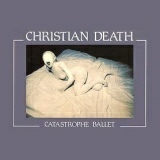 Christian Death are generally credited with giving Gothic Rock its romantic style, and it’s hard not to be sucked in as the music shudders its way between the weirdness of Awake At The Wall, backing screams giving it a very uneasy atmosphere, and the more forward and Punky likes of Sleepwalk. As the album fades with This Fleeing Somnambulist, strange noises twisting like the dying wails of some ancient beast, it’s hard not to wonder what on earth you’ve just heard. Different from most people’s idea of Rock, it’s twitchy and fragile, nowhere near the moment of screaming horror that you’d expect from the Pompeiian artwork, but eerie enough to make it interesting to those who enjoy atmospheric music in general. Those more at home with 80s Goth Rock than I will be able to state how important it is in the scheme of things, but with my limited knowledge it’s an album Season Of Mist have done well to reissue, without being vital to many.